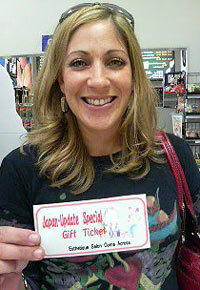 Suzie Frederick is the latest winner of a Y5,000 gift coupon to Esthetiq Salon Come Across. The Arizona native calls her two and half years on Okinawa “fabulous,” and spends her free time exploring the island and learning about its culture as much as possible. With her family, she also likes scuba diving, traveling, camping and trying new restaurants. 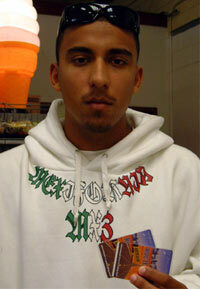 Jose Diaz is from San Diego, CA, and he won \4,000 telephone cards courtesy of KDDI Route K-OK. He has been on Okinawa five months, and enjoys going out with friends. He says that he finds “Okinawa is fine although it does not compare to back home.” Especially he says it get too hot here in the summertime.